One the the ways the National Oceanic and Atmospheric Administration classifies natural disaster and severe weather events is by their economic and financial impact. The so called “Billion Record” lists all natural disasters of recent years that have cost the US economy upwards of a billion dollars in damages, rescue, insurance claims and reconstruction. This cold and calculated approach (that does not even directly consider human lives lost beyond damages) reveals an unsettling fact in its recent records: the last decade, and the last three years in particular, have seen more natural disaster related damage and loss compare to any other time in recorded American history. The UN’s Office for Disaster Risk Reduction datasets and inforgraphics paint a much more complete picture: In the years 2000 to 2012 more than 1.2 million people died from causes related to natural disaster, 2.9 billion have been severely affected and the overall damage was estimated at nearly 2 trillion dollars(!). This survery too, shows a dramatic increase in the frequency and severity of natural disasters in the ‘00s to this day. Interestingly, (and very much related to the NOAA’s choice of perspective) the US lead the charts in monetary damage, but is not even on the charts when it comes to number of people affected or killed. In China, 2.5 billion people have been affected by natural disaster in those years (and that’s more than once per person if you can’t do the math), Haiti alone lost more than 230 thousand lives. Following on the theme of climate change inaction, denial and apathy, even in face of overwhelmingly catastrophic evidence, prediction and cost in life and economic damage, I want to explore the theme of natural disaster as disruption, intervention by nature in the course of human routine life and an emergency wake-up call some still choose and have the luxury of ignoring. At this point I’d like to stress that I do not consider all urban dwellers the same.According to the US Census Urban areas in the US have a much higher Gini score (a coefficient widely used as a measure of inequality), especially in coastal areas that are prone to natural disaster (Tri-state area [NY is the most unequal city in the United States], Florida’s coast line and the West Coast Bay area). Level of income and socio-economic class significantly affect the resiliency and preparedness of households in large cities, from the quality of home construction to the ability to store essential supplies to the impact of having to skip work for a couple of days. Thus, in this project I want to target a specific public - sheltered upper-middle-class residents of urban areas that afford themselves the luxury of keeping about their daily lives in the face of imminent global natural catastrophe, pushing them to experience the disruption of such disaster, albeit through transformation and metaphor, and by disrupting the symbols of urban technological comfort on which we’ve come to rely - free WiFi, constant connectivity, privacy, immediate connection everywhere. As the saying goes “great technology is invisible”, technological developments that have become ubiquitous have merged into the background and we no longer notice our reliance on them. Think of the fact that you can swipe a plastic card to purchase goods and services in almost any developed country, cars, trains and planes operate on such massive scale you could reach a small town in Australia within a couple of days with a combination of air travel and public transport. In the same vane, wireless technology has merged into the background of daily life for many of us, and we have come to expect and rely on cell and wifi connectivity anywhere we go. Conversely, dwellers of large metropolitan areas have grown more and more removed from nature as cities turn into megacities that stretch dozens of miles from end to end, are constantly lit and block the night (and sometimes day) sky, and support little to no wildlife that is not seen as a pest. Natural disaster, in this metaphor, is an urgent interruption by mother nature and an abrupt reminder that concrete walls and glass halls won’t protect us forever. The disaster machine is a portable mini computer (Raspberry Pi) with some additional circuitry and electrical components that are designed to jam any cell reception and takeover public WiFi networks in a man-in-the-middle attack. When the device is active, no LTE, 4G or 3G signal can be used in the nearby environment and particular public WiFi networks will be hijacked, and the login screen asking to join free WiFi will be customized. When a significant natural disaster occurs in the US or elsewhere in the world, the Disaster Machine will be deployed around New York City in locations where locals are accustomed to find comfort, such as cafes, public train co-working spaces and public halls. When users attempt to connect to local WiFi service, they will be promoted with the typical “Click for Free WiFi” screen, but the screen will not display a login option, rather live footage from disaster affected areas and relevant information about the scale and damage, under the theme “Right now in ____”. The login screen can be closed, but not overridden or disabled for the duration of the intervention, and WiFi service will not be available, it will however allow the transition to further web resources as internet service resumes when the devices are disabled. Does the shock of losing connectivity and seemingly being “hacked” a trigger that is too strong to make users acknowledge the content presented to them? Is a persistent and aggressive approach useful in soliciting engagement? How can content be presented to mitigate the initial “hostile” experience and capture long-term attention? Though these issues need to be thoughtfully considered and subtly integrated, I think the platform is still a powerful one, to introduce the metaphor of natural disaster as disruption and interference and engage an otherwise sheltered and, at times indifferent, public. According to the NOAA, FEMA and other US environmental agencies, sea level rise in NYC is predicted to reach at least 8 inches by 2050 (just shy of 30 years away). The so called 1% estimate, the worst case scenario, predicts up to 30 inches of sea level rise - a widely accepted catastrophic yet realistic prediction. In the NYC area in specific, this means large areas of Downtown, the West Side and Greenpoint as well as Jersey City’s waterfront will be flooded. I was shocked to see such unsettling and bleakly certain predictions and I am unable to understand how we, as people of the world, residents of New York and HUMANS WHO WILL LIVE THROUGH THIS DISASTROUS FLOOD, fail to act in a more determined, organized and proactive fashion. Research I reviewed on the perception of climate change pointed to abstract representations and generalized climate change information being a core cause for the lack of persisting internalization of the risk and a reduced willingness to act on climate change amongst many demographics in the US. The sense of detachment from the problem (when presented with images of melting ice caps and natural disaster abroad) and its vast scale often lead to a feeling of powerlessness, resulting in suppression and avoidance of the problem. This made a lot of sense - as being presented with the overwhelmingly catastrophic results of global warming be a great motivator, but also leave one feeling paralyzed in face of the vast scale of the problem and choose a path of avoidance or ignorance, even if doing so subliminally. The research on climate change perception found that, on average, delivering localized information about climate change reduced perceived psychological distance, had a positive impact on the subject’s willingness to act and sustaining a long term connection with the issue. It seems to me that by localizing the threat the viewer’s reaction is one not only of awe but of horror, unnerving the self-boundary and forcing a defensive reaction - in which case ignorance is not an option. The introduction to a particular discussion, piece of information or a critical perspective must be subtle, simplified, even cunning, and leverage the audience’s emotion and experience of either awe, horror or menace. The self-boundary shifting nature of these sensations seems to be a powerful gateway to harnessing audience attention and triggering a response of either wonder or defense - a self-expanding emotion that opens the viewer’s mind and awareness beyond their self, and promotes consideration of their environment and society. It’s been shown that clear and concrete information, that is localized in time and space to the specific audience targeted, has more impact than abstract ideas and remote depictions of change, as catastrophic as it may be. Within our current political climate, immediate implications are some, if not the only, means of penetrating a top-down onslaught of dismissive propaganda that is aimed at maintaining political and capital interest above the environmental future not only of polar bears, but of all of citizens of this country. In an effort to drive engagement and present concrete information that could hopefully lead to increased public action, project should immerse the viewer in the presented reality/state/information in a way that goes beyond abstracted artistic depictions. How can the realities of climate change be made visceral and perceivable to their true extent? how can this tactic be used to pierce through the hard shell of political propaganda, immediate self-interest and general apathy? Awe, menace and horror should be fully leveraged at this stage to trigger a need for accommodation of this troubling (and frequently suppressed) information in a way that defines a new schema with which to consider climate change as a pressing, significant part of current affairs. The grand hope of this framework is to facilitate building socially engaged art projects that engage audiences deeply and force them to reconsider and re-accomodate the issues at hand. If successful, would that make the viewers more prone to action, making it the perfect the time to plug a call for action? I’m approaching the call for action very carefully as it could easily turn into a “get out of jail free” conscious-clearing escape that defeats the purpose of long term engagement. With climate change, for example, is a one time contribution to a non-profit better than calling for long-term engagement, prompting political action by allowing viewers to message their elected representatives or share the project on social networks to increase its exposure? The Blue Line Project addresses the future impact of rising sea levels, as predicted by the 1% prediction, on residents of New York City. It is the first part of a project aimed at making the catastrophic impact climate change visible in sheltered urban centers. It aims to make visible a future reality in which large parts of downtown Manhattan, Brooklyn and Jersey City will be knee deep in sea water. Using simple blue tape or blue paint, I will mark future sea levels around Battery Park, South Sea Port and North East Village, Greenepoint, Williamsburg, DUMBO, Jersey City’s waterfront to the level where they are predicted to reach by 2050. I’m focusing on these areas since they are both high-risk waterfront areas but also zones of active gentrification and centers of capital, representing the sheltered class that can “buy its comfort and time” until nature will ironically occupy that land. The second part of the project, to which viewers will be directed, will be a web-based mobile AR application that will be driven by FEMA sea-rise predictions and will show a location-based animation of the rising water level in the next 30 years overlaid on the phone’s camera view. This will provide viewers with a hyper-local, visceral view of how climate change relates to them in specific, to their lives, neighborhoods, families and homes - not just remote and abstract ideas that are removed from daily life. This is a brain dump of key findings in research I’ve been reviewing on Dispositional Awe, Climate Change Perception, Menace and Absorption with the aim of better understanding the psycho-physiological components of the awe experience, or lack there of, on persons and societies, and how it can be harnessed as a communication tool to increase persisting awareness to the threat of anthropogenic climate change. In reviewing these papers, I’ve gained insight into the triggers of the awe experience: vastness (physical or metaphorical) and NFA (need for accommodation) as well as its lack of clear valence as a positive or negative emotion, how it can destabilize, alter self-concept, increase prosocial attitude and a sense of connectedness to society and nature beyond one’s self-feature. I've also reviewed literature on climate change perception, denial and inaction and learned that abstract notions of climate change and detachment from its immediate implications (in the case of middle-class and above urban dwellers in the United States) is one of the key identified causes for lack of action and a greater psychological distance perceptions. I’m interested in using awe as a introductory mechanism for presenting concrete, localized implications on global warming, tying together awe and menace and leveraging the altered state of mind associated with awesome experiences and the enhanced psychological proximity perceptions to increase climate change engagement and persist an intention to act in my audiences. A particular topic I’m currently trying to understand and design for is the complex emotional and experiential mechanism that controls the self-boundary, self-transcendence and prosocial attitude. Leveraging awe to introduce localized, disturbing facts on climate change impacts can be perceived by audiences as a manipulation or cancelling out desired emotional affect. I wonder what imagery and delivery methods could be used to instill a sense of awe in viewers? How to relocate the disruption of natural disasters and climate change to the sheltered urban environment? How to deliver a localized, non-abstracted image of the perils of global warming in a way that drives long term engagement and a willingness to act? Research indicates that contact with natural settings, as opposed to built settings with human-made characteristics such as buildings and cityscapes, can promote physical health, restoration from mental fatigue, a sense of meaning in life, a broadened sense of connectedness to all forms of life and prosocial tendencies. Taken together, these studies provide evidence that positive behavior-specific emotions (i.e., expecting to feel good for saving energy) may facilitate sustained action over time, as well as action more broadly, relative to negative behavior-specific emotions. Researchers have argued that one important reason for this indifference toward climate change may be the perception that the risk is abstract and psychologically distant, that is, its uncertain impacts will affect other people, will happen in other places or sometime in the future. Today, how to effectively communicate climate change in a way that makes the issue more real, local, urgent and relevant is a challenge. The greater psychological distance perceptions further discouraged people's concern for climate change and intention to act, though the effect was small relative to other environmentalism factors such as self-efficacy and self-transcendent values. As my current research and project development relate to awe (or lack there of), nature deprivation and hypernatural environments, I decided to run two daily experiments in parallel. First, I would attempt to find awe in the city, I didn’t know if awe-inspiring sights would end up being natural or man made, but I tried to pay more attention to my environment beyond the mindless morning commute and shoegaze wandering. Second, I tried to artificially insert awe into scenes of my daily life using inspiration from my travels and natural sights that left a lasting impression on me. As I somewhat suspected, finding natural awe in the city is a very difficult task. The little green hidden in the otherwise concrete jungle is tame, orderly and scaled as to no interfere with the going-ons of the city. Trees are equidistant and manicured, bushes are lined around lawns and pavements, and nature is reduces to mere decoration - hardly an awe-some sight, and quite the opposite, In my search was left with a longing for the wild and ranging mountains I saw when I traveled in New Zealand, Japan and Germany. I did however find awe and wander in the remarkable architectural achievement situated in the city, from the One World Trade Center, to the adjacent Oculus hall and spreading wings, Empire State building and Grand Central’s main concourse - I even got a chance to see NY’s beautiful skyline from New Jersey’s waterfront. It is striking though how urban and manufactured these views and structures are, and how the city interferes with the nature that surrounds it. Light pollution blanks the starless skies and the water flows slowly through the lined rivers. I tried to imagine an alternative in which the city blends into nature rather than erase and obstruct it, by simply photoshopping Washington Square Park and NY’s downtown skyline with a bit of natural wander. I have to say that after viewing the (somewhat sloppy) results, I wish I was closer to nature every day. After reading through Steve Easterbook's Systems analysis of GMO protests in the UK, I decided to approach the system mapping of Caloric Energy from multiple perspectives, understanding the different points of view and boundaries that could be applied to this topic. Scientists across fields established defined units of measurement that quantify and describe anything from time, distance, scale and magnitude. Energy, for example, is measured in Joules and various kinds of energy and energetic substances can be compared and standardized. Caloric energy, in this context, is defined as the amount of energy needed to heat up water by one degree celsius. The international system of units does not, however, exist in isolation. It is subject to the progress and politics of science, such as the standardization of the metric and imperial measurement systems that are mutually exclusive and incompatible. The process of measurement itself is also dependent on factors such as scientific progress and environmental conditions, the process of measuring calories involves heating water, which requires different amounts of energy depending on local climate and barometric pressure. Different foods, depending on their nutritional content, contribute differently to a balanced diet, sustaining the human body in both energy and micro and macronutrients. The way in which a certain food's nutritional quality is measured is usually via it's nutritional density, the ratio of caloric energy to nutritional value, calories that come from foods with low nutritional value are considered empty calories. The calorie intake of an average human varies by country and is used as a benchmark for the average amount of food we must eat daily. Commercially sold foods must be labeled for their caloric value as well as nutritional value. Only some nutrients are detailed in the label and these depend on the governing health and nutrition policy of the local government. The food industry, and health foods as well as fast or junk food in particular, are focused on marketing nutritional value, and the impression of such, in their food products. Terms such as "low calorie", "diet" and "zero calorie" are frequently used to persuade consumers of health benefits or positive nutritional balance in these products. Such terms are now regulated in many countries around the world, defining strict standards for what constitutes a "low calorie" food. Caloric value also plays a role in the actual ingredients of such foods, as economies of scale made it so that "empty calories" or calories from fats and simple carbs are cheaper. The fact that not all calories are equally priced are at the core of a health and obesity epidemic that impacts low income households the most, as they are often unable to afford high nutritional value food and opt for "junk food" that has more marketing value than nutritional one. Caloric energy is an interesting subject for systems analysis, as different perspectives and system boundaries relate to science, health, politics, business and marketing. The systems described above are only three top-level and distinct ones, though many crossing systems can probably be identified as well. In creating a taxonomy of The Science and Business of food (measurement), I decided to set a particular system boundary and perspective that will allow me to focus my guide and direct further research. I want to shine a light at how misleading marketing, use of nutritional terminology and buzzwords, fuzzy food science and an overwhelming range of food quality indices work in favor of large food corporations and against the individual trying to maintain a balanced and healthy diet. In exploring this topic and forming a taxonomy it became ever clearer that the number of nutritional variables that are “scientifically established” are far more than can be expected of a casual shopper to memorize and consider. At the same time, I was surprised to discover how many terms have become regulated by the FDA due to abuse, misinformation and blatant disregard for consumer health by food manufacturers, these includes “low fat”, “zero sugar”, “low calories” and even “artisanal” for crying out loud! In order to design a field guide for survival in “food swamps” and “food deserts”, I had to expand and focus my taxonomy of “Food Quality & Measurement” and incorporate aspects of the food business to build a more complete picture of the reality of food deserts. I’ve also begun to study visual references to food deserts, and how how they leverage visual analogies, metaphors and metonymies to illustrate and draw attention to many parts of the problem, from mapping food deserts as an epidemic, using cartoons to link food deserts to junk food conglomerates and provide visual aids to help navigate the knowledge area. Maps are a very powerful way of illustrating to extent of a particular problem or the reach of an issue. When looking for maps of food deserts in the United States, I found that most adopted a light-to-dark brown sand-colored color scheme, reminiscent of desert colors. It was surprising to see how consistent this color scheme was between different publications and online references and made it clear that color is useful as a strong visual reference. Many caricatures juxtaposed known images of junk food and desert scenes to drive the point that food deserts can be deceptively full of (unhealthy) food options, and that these can be seen as a mirage to mask the issue and fool those who cannot afford or an uneducated on healthy food and balanced nutrition. What I loved about these illustrations is that they reclaimed branding and iconography, so dear to the hearts of corporate marketeers, to pose a poignant comparison between fast food chains, junk food and food deserts. In these illustrations, M doesn’t stand for “I’m loving it”, it stands for “You’re feeding me trash”. Infographics are also heavily used to illustrate the extent of the nutritional crisis in the United States, and provide extended information and breakdowns in a digestible (no pun intended) visual format. While more abstract in reference, these infographics still draw direct comparisons between certain foods and brands (McDonald’s burger is starring here too) and the general issue, using it as an icon for food deserts as a whole. Finally, I looked from imagery that is familiar to me from Bushwick, Brooklyn and other parts of the city. These images are in themselves a juxtaposition, depicting food stores and convenience stores but showing only low nutrient-density, processed food options. This is one of the trickiest problems in battling food deserts as food seems plentiful and easily available, yet it is not really nutritious - a mirage. 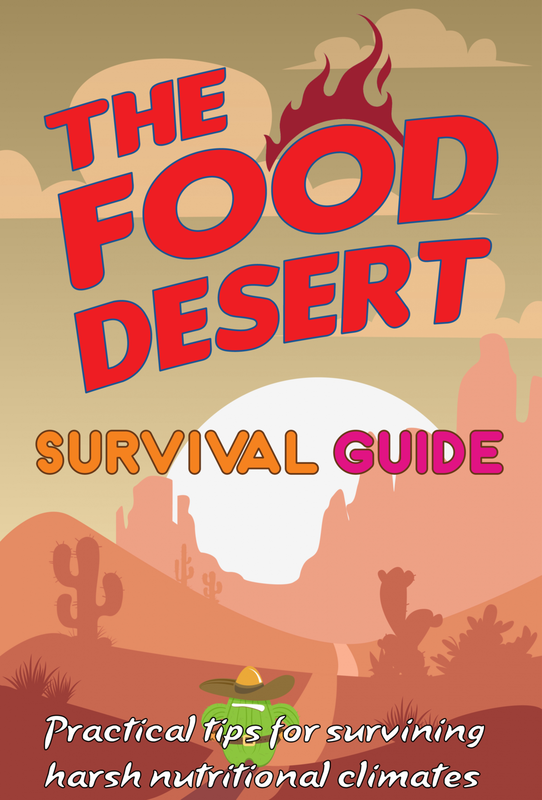 The second part of my visual prep study was into harsh environment survival guides, as I decided to position my guide as a “Food Desert & Swamp Survival Guide”. In particular, I was looking for examples for visual styles, focus areas in survival (navigation, classification, tool making, etc.) and the overall tone of the guide (directional, encouraging, dry, humouristic, etc.). My first stop in the search was WikiHow’s desert survival guide, which provided a very comprehensive guide to identifying desert objects and fauna, how to pack, how to extract water and navigate challenging terrain. Funnily enough, the packing guide perfectly illustrates the issue at the core of food deserts. The guide uses many visual techniques to illustrate instructions, from lists of objects, to embedded infographics, zoomed in step-by-steps and follow-the-arrow demonstrations. These are all great inspiration for the guide. Next I looked for references for the visual style, and found old SAS, Navy and Air Ministry desert survival guides, they all seemed quite dated and ranged from a more lax to a stern and pragmatic tone. I also liked their vintage dated look. What I learned from looking at these guides is that they are designed for on-site practical use that focuses on both immediate problem solving and long-term planning and preparation information. For example, knowing how to plan ahead for travel in different times of the say as well as how to extract water from plants at time of need. This applies to my plan for the Food Desert Survival Guide as I want it to serve as a practical how-to at time of need (while shopping for instance) but also provide guidance towards transforming the community and building a more sustainable nutritional environment. Now it’s time to start crafting the visual style of my own guide. As I mentioned, I quite like the visual metaphor of a real desert used in infographics and caricatures, as well as the subversion of marketing and branding as warning signs - using the same icons and logos not to draw customers but to warn them. I thought about a few examples of where this visual juxtaposition and combination would be the most poignant. I sketched out a few key pages the guide will feature, with a focus on style and iconography and particular skills I think are important, such as understanding nutritional facts, posing food deserts as an epidemic in terms of mapping and visualization, introduction to long-term skills such as community gardening.